None Joseph Gibson was a former Green Beret, and a member of the 7th Airborne. 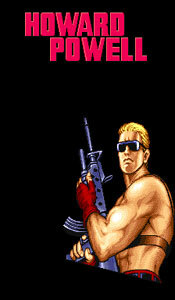 A master of a variety of weapons, he is now a member of the elite group of mercenaries named M.E.R.C.S. Commander of the M.E.R.C.S. None Howard Powell was a former leader of an anti-terrorist task force. Fed up with government regulations on his unit's practices, he left the military and formed the elite para-military group, M.E.R.C.S. As leader of the M.E.R.C.S., Howard was secretly contacted by the U.S. government when a revolutionary group attempting to take over the central african nation of Zutula kidnapped a former U..S. president on a diplomatic trip. He is being asked to deploy his elite group in Zutula and rescue the former president. None A former Air Force officer, he was a talented mechanic and weapons expert while there. Later joined the M.E.R.C.S. 100 These are the normal recruits of the revolutionary army. They armed with Soviet AK47s and some hand grenades. Concerned with what they view to be economic imperialism by the Western powers (U.S., England, France, etc), they have taken arms against the pro-Western Zutula government and are calling for a redistribution of the wealth. These soldiers sympathize with the revolutionary cause and will fight to the very death for the freedom of Zutula. 10,000 The Zutula revolutionary group has been able to commandeer a U.S.-made Harrier jet sold to the now overthrown pro-Western Zutula government. Fortunately, this is the only Harriet jet in the revolutionary group's arsenal. The Harriet jet is a marvel of air technology. It allows the jet to hover in mid-air and move fast . 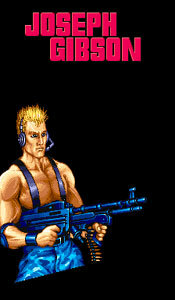 Armed with twin Gatling guns, this enemy is very dangerous. 1,000 These jeeps are part of the many military sales the U.S. has made to the former Zutula government. They have now been taken by the revolutionary Zutula group. The jeeps contain space for two passengers in the front, and a heavy machine gunner in the back. Watch out, they are quck. 1,000 Knowing the U.S. might send covert operatives to destabilize the revolution, the revolutionary group of Zutula hastily constructed these sentry towers to increase ground defenses. The towers contain 2 sniper gunners. The towers can take a lot of damage before blowing up, so shoot at them. 1,000 These tanks were part of the many military sales the U.S. made to the former Zutula government. Using Soviet trained drivers, the Zutula revolutionary group has deployed these tanks along its borders. 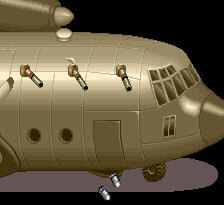 The tanks have a turret to shoot tank shells (very damaging) and a port hole from which a normal gunner can shoot. Tanks are slow, however. 500 Using U.S. Army motorcycles, these revolutionaries hurl grenades from a distance. If you get close, they will ride away. Get them before they can leave. 15,000 After the overthrow of the pro-Western government, the Soviets wanted to extend a helping hand to the revolutionary group. They sent this moving monstrosity as a token of goodwill. The Soviet Super Tank is armed with side flamethrowers, missile turrets, and a special napalm weapon in the back. The revolutionaries have only one, as the Soviets cannot spare to give more to the new government of Zutula. 5,000 Part of military sales between the U.S. and the former Zutula government. The U.S. APC is a half tank/half bus vehicle. It is designed to transport a large amount of soldiers quickly between territories. The revolutionaries have about a dozen of these APCs. The APC is encased in strong, metal armor and has positions for two heavy machine gunners to provide cover for the exiting soldiers. It also carries a large amount of soldiers to a given area. 5,000 Part of military sales between the U.S. and the former Zutula government. The U.S. AME is designed to be paired with an APC. They provide cover for the APC during battles. The revolutionaries have about a dozen of these. Like the APC, the AME has strong, metal armor and positions for 2 heavy machine gunners. The AME has an extra missile turret for added firepower. 500 Part of the Soviet military goodwill package, these stationary missile turrets add strength to the ground forces of the revolutionary group. The turrets are completely unmanned and controlled by an intelligent Soviet computer system. The turret can go around 360 degrees and fires deadly missiles at you. The missiles are quick, so don't get too close to these guys. Manning state of the art U.S, these revolutionary soldiers are well-armed. 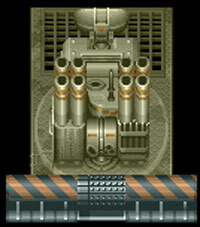 The Revolving Machine Gun Turret allows the shooter to aim in a complete circle. 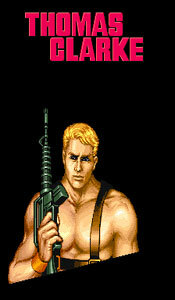 Sometimes, if you kill the shooter, you can man the machine gun and use it against the enemy. These revolutionaries are armed with U.S. army bazookas, from the arsenal of the former government. One bazooka hit could send your soldier flying in the air. This is the Soviet Union's response to the U.S. Apache. 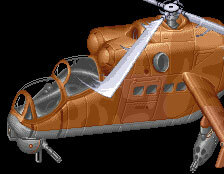 A highly versatile vehicle, the Soviet Attack Helicopter is armed with a forward Gatling gun, and rear multiple missle launcher. The Soviet Helicopters are also large in capacity, allowing them to bring extra soldiers to a given area. The revolutionaries only have one. Trained in water movement, these fighters can move through water as if it wasn't there. They are faster than you are in water movement, and they're knives hurt a lot. Shoot them from a distance when one of them surfaces from the water. These torpedo boats are designed for amphibious missions. They are equipped with underwater torpedoes and are pretty quick vehicles. Sometimes you can kill the driver of one of the vehicles, and use the torpedo boats in water areas. The Soviets have jumpstarted revolutionary Zutula's Navy by donating this small, but powerful Soviet Destroyer Class ship. The Destroyer has multiple grenade launcher turrets and a strong flame thrower with plenty of gasoline to power it. The armor of the destroyer has been reinforced with titanium, requiring a lot of shots to destroy it. The revolutionaries have only one. Nothing special about these trucks (what were you expecting, a James Bond type army truck?). These are normal vehicles that transport troops from area to area. The usually will begin dropping soldiers if not destroyed quickly. By far the most expensive contribution of the Soviet Union to Zutula. A fully nuclear powered supply train. It's nuclear power allows it to travel at bullet speeds on Soviet train tracks on Zutula. Secretly, though, Zutula's government is attempt to build nuclear missiles on the supply train, to prevent a U.S. invasion. If you see one of these, the revolutionaries must be becoming desperate. These are normal construction vehicles, but if the revolutionaries find themselves in a dire position, they will use the construction vehicles as rams against invading enemies. You have caught the revolutionary pilots on the airfield! Unable to liftoff before you enter, they will attempt to use their jets' Gatling guns on the ground. Shoot their disabled jets quickly! 30,000 A Soviet invention, this extremely fast missile turrets launches modern missiles at high speeds. The accuracy rate of the missiles has been very high in preliminary tests. Watch out. Whatever you do, don't stand in one place. The U.S. Airforce Hercules transport is the latest in presidential protection and mobility. Armed with multiple missile turrets, and reinforced with titanium, the Hercules Transport is incredible strong. The revolutionaries are making a break for it with the former president inside. Stop the Hercules from flying away.